Twenty-five years after the first women enrolled in classes at Penn, a total of 317 women were enrolled in six different academic programs. The great majority of women attended classes on a part time basis in the Courses for Teachers program and were not candidates for degrees. 66 women were full time students, enrolled in the Department of Music, the Department of Biology, the Graduate School of Arts and Sciences or the Law School. They aimed to earn a degree and enter a profession of their choice. In addition there were 68 women enrolled in the University Hospital Training School for Nurses. They were also full time students. They aimed to complete the School’s three-year course and earn its diploma in nursing. The University of Pennsylvania Catalogue for 1901-02 contained a brief account of the Training School for Nurses listed the sixteen students who formed the Graduating Class of 1901. It was also at the Hospital that women held senior administrative and academic administrator positions. Jean W. McPherson combined both functions in a single position, serving simultaneously as Superintendent of the Hospital and Directress of Nurses. As Superintendent, she was responsible for one of the largest budgets and largest payrolls on campus; as Directress, she was the chief academic officer of the Training School for Nurses. HUP admitted more than 2,600 patients in 1901 and treated another 13,200 on an out-patient basis. She managed annual expenditures of $142,000, which included a payroll of $33,000. No other woman at Penn held an administrative position remotely approaching the authority of the Superintendent of the Hospital. The Assistant Superintendent of the Hospital was also a woman, Elsie F.M. Chambers. Ms. McPherson and Ms. Chambers were also the chief academic administrators, senior teachers, and supervisors of student life in the Training School for Nurses. They were responsible for the student nurses both in the classroom and in the Nurses’ Home, where the entire student body was required to live. Lastly, a few women held salaried positions among the University staff. The most prominent were Margaret Center Klingelsmith (LL.B., 1898), Librarian of the Biddle Law Library, and Susan W. Randall, Assistant Librarian of the University. There were another fifteen women working in the University Library, whose responsibilities were already specialized along the modern departmental units of acquisitions, cataloging, circulation, public services, and departmental libraries. There were also Dr. Ryder and Ms. Kuhn, in the Department of Physical Education, as described in the entry for 1899, above. That while highly appreciating the generous offer made by Miss [Fanny Rysam Mulford] Hitchcock for establishment of one or more undergraduate courses for women, leading to a degree in Arts or Science, the Trustees of the University of Pennsylvania, after careful consultation with the officers of instruction and government, are unable to recede from the position announced by them in previous years; viz., that they would undertake the establishment of a separate College for Women as soon as they should be provided with adequate funds for that purpose. They cannot regard the plan proposed by Miss Hitchcock as within the lines of their declared policy, and therefore, with much regret, and a sincere sympathy in her desire to advance the education of women, are obliged to withhold their approval of the particular plan proposed by her in her communication of February 26, 1901. In May, Dr. Fanny Rysam Mulford Hitchcock informed the Trustees that she did not desire to be re-elected “Director of Women Students of the University.” The Trustees adopted a resolution which thanked her for “the services she has rendered in that capacity” and also stated that the Trustees would not elect a successor to Ms. Hitchcock. At the celebration of University Day, held on 22 February, Agnes Repplier, the nationally-prominent Philadelphia author, became the third woman recipient of an honorary degree at Penn. The Trustees granted her the honorary degree of Doctor of Letters (Hon. Litt.D.) in recognition of her revival of “the art well-nigh lost in these days, of the Essayist.” She was the second woman to be awarded the honorary Litt.D. degree at Penn. In January, the Trustees elected seven faculty members to the Board of Managers of the Graduate Department for Women, none of them women. Sara Yorke Stevenson was elected President of the Board of Managers of the University Museum. Though she served just one year, she was the first woman to serve as President or Chair of the University Museum. The College faculty founded the Summer School Courses and admitted women to this program from its inception. A Certificate of Proficiency was granted to those who successfully completed the course. Delta Delta Delta was established, the second sorority at Penn. At the Commencement held on 13 June, the University granted the degree of Master of Science in Zoology to Hannah May Blake (B.S. in Biol., 1905) and in Chemistry to Lucy Middleton Griscom (B.S. in Biol., 1903). They were the first women to earn the modern M.S. degree at Penn. College Courses for Teachers (CCT) was founded and admitted women from its inception. The CCT was the predecessor to the College of General Studies (CGS) and its courses led to the degrees of Bachelor of Arts and Bachelor of Science. At the celebration of University Day, held on 22 February, Cecelia Beaux, the celebrated Philadelphia artist, became the fourth woman recipient of an honorary degree at Penn. The Trustees granted her the honorary degree of Doctor of Laws (Hon. LL.D.) in recognition of her achievements in the field of portraiture. She was the first woman to be awarded the honorary LL.D. degree at Penn. At the Commencement held on 17 June, the University awarded the degree of Bachelor of Arts to Pauline Wolcott Spencer. She was the first woman to earn the A.B. degree at Penn. At the same Commencement the University awarded the degree of Bachelor of Science to Zeta Berenice Cundey. These two women were the first to complete the requirements for the bachelor’s degree at Penn through the College Courses for Teachers program. Both women were career teachers in the Philadelphia public schools. Pauline Spencer taught the history of education at the Philadelphia Normal School for Girls and Zeta Cundey was head of the English department at the William Penn High School for Girls. Both served as President of the University’s Alumnae Association during the first decade of its existence. In February, women students petitioned the Trustees for the appointment of a Dean of Women. The Trustees referred to the petition to Provost Edgar Fahs Smith. No action was taken. In May, the Alumnae Association of the University of Pennsylvania was founded. Its purposes were “to unite the women graduates of the University of Pennsylvania and to further among them a spirit of cooperation in work and fellowship; to promote the welfare of the women students at the University; and to keep alive the interest of the women graduates in all the activities of their Alma Mater.” The first officers were Pauline Wolcott Spencer (A.B., 1908; A.M. in Latin, Sociology, and Psychology, 1910; and Ph.D. in Sociology, 1915), Sarah Pleis Miller (B.S. in Biology, 1899 and Ph.D. in Chemistry, 1904), Jennie Ritner Beale (A.M. in English Literature and Ethics, 1910), Zeta Berenice Cundey (B.S., 1908 and A.M. in English Literature, 1913), Eleanor Fulton Karsner (B.S. in Biology, 1905 and A.M. in Sociology, 1914), and Mrs. Elizabeth N. Woolman Pennock (Certificate of Proficiency in Chemistry, 1893). At the Commencement held in June, the University awarded the degree of Doctor of Philosophy in Sociology to Alice Paul. She was the first woman at Penn to earn the Ph.D. degree in Sociology. Four years later, in June 1916, Alice Paul founded the National Woman’s Party, the chief purpose of which was to lobby for the immediate passage of an amendment to the U.S. Constitution which guaranteed to women the right to vote. The 19th Amendment to the Constitution was ratified in 1920. Alice Paul and the National Woman’s Party then turned their attention to the adoption of an Equal Rights Amendment for women. Though this second effort was not successful, it propelled Alice Paul to national leadership in the women’s rights movement. In 1938 Paul founded the World Woman’s Party in Geneva, Switzerland and in the years immediately following World War II, the World Woman’s Party lobbied successfully for the inclusion of equality provisions in the United Nations charter. In October, the Trustees authorized the expenditure of $1,000 for furnishing and equipping a women’s dormitory on South Thirty-Fourth Street. Undergraduate women compile and publish their first yearbook, The Record, a manuscript work of twenty-eight pages. All copies were prepared by hand, with class photographs reproduced and prints hand pasted to the pages. The Women’s Dormitory was opened in two houses at 120-22 South Thirty-Fourth Street, at the southwest corner of Thirty-Fourth and Sansom Streets. The twelve residence rooms were available only to women enrolled in the Graduate School of Arts and Sciences, but the buildings’ rest rooms and dining hall were open to all women at Penn. 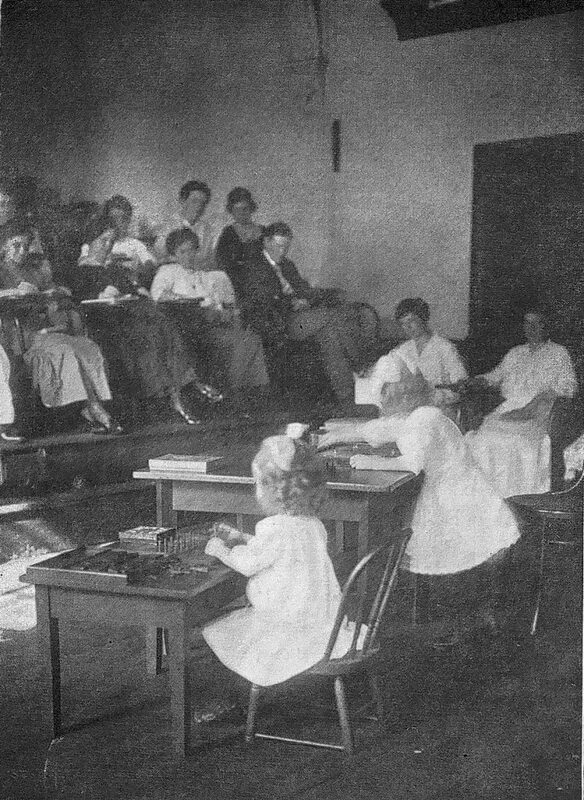 The School of Education was founded and was the ninth academic program at Penn to admit women from its inception, but the first to offer a modern, full-time, four-year, undergraduate, professional degree to women. The School of Medicine and the School of Dental Medicine admitted women for the first time. Undergraduate Penn women published The Quill: The Girls’ Book as a gift to the Class of 1915. It was a twenty-four page, illustrated booklet, “striving,” its editors stated, “towards a College Record Book for the Girls of the University of Pennsylvania.” The Quill described women’s student life activities in the 1914-15 academic year, including the “Pêle Mêle” musical comedy and songfest; the second “Annual Dance” sponsored by women in Houston Hall; and the “Senior-Junior Frolic at Wildwood-by-the-Sea.” The Quill also demonstrated that Penn women had organized a student government, the Women’s Undergraduate Association, and elected class officers in each of the four undergraduate classes. In addition the women had formed at least two student clubs and maintained their support of two sororities, Kappa Kappa Gamma and Delta Delta Delta. Lydia Katharine Adams (A.B., 1916) was the first Editor-in-Chief of the women’s Record. She was also a member of the undergraduate women’s English Club; a member of the cast for the women’s dramatic performance, “Pele Mele,” in 1915; and President of the Senior Class in 1915-16. She was also a member of Kappa Kappa Gamma sorority. At the Commencement held on 16 June, the University awarded the Bachelor of Science in Education degree to Elsie May Bartlett, Cora Hallman Buckwalter, and Elmira Lodor. They were the first women to earn the B.S. in Ed. degree at Penn. Penn women form a women’s chapter of the Catholic Students’ Organization Committee, which, in 1920, changed its name to the Newman Club. The women’s chapter had its own organization and officers. The first President of the women’s chapter was Susan Genevieve MacMurray (A.M., 1914), who, in 1914-15 and 1915-16, was a student in the Graduate School of Arts and Sciences while simultaneously teaching at the Philadelphia High School for Girls. The President in the 1916-17 academic year and therefore the second President of the women’s chapter was Maryrose McIlvain Davis (B.S. in Ed., June 1918). The Penn men’s chapter of the Newman Club had been founded about 1893. The Newman Club was a religious service organization for Roman Catholic students, faculty, staff, alumni, as well as the general public. At the Commencement held on 21 June, Margaret Center Klingelsmith (LL.B. 1898), Librarian of the Law School from 1898 to 1939, became the fifth woman recipient of an honorary degree at Penn. The Trustees granted her the honorary degree of Master of Laws (Hon. LL.M.) in recognition of her several accomplishments: author of authoritative biographies of distinguished jurists; successful collector, on behalf of the Biddle Law Library, of rare books on the sources of English Law; and translator of legal classics from Old and Middle English. She was the first woman to be awarded the honorary LL.M.degree at Penn, the first alumna of the University to be awarded an honorary degree, and the first woman faculty or staff member of the University to be awarded an honorary degree. At the Commencement held on 21 June, the University awarded the Doctor of Public Hygiene to Dorothy Child, Mary M.C. Langdon, and Annie Young. They were the first women to earn the Dr. P.H. degree at Penn. Pi Lambda Theta, a national honors society open to students enrolled in the School of Education, established a chapter at the University of Pennsylvania. Six women students form the Penn women’s section of the Young Women’s Christian Association, which later took the shortened name of Christian Association (CA). The women’s section had its own organization and officers. The first President of the women’s section was Mary Guard Wright (B.S. in Ed., June 1917). The President in the 1917-18 academic year and therefore the second President of the women’s section was Clara S. Evans (B.S. in Ed., 1918). The Penn men’s chapter of the CA had been founded about 1891. The CA was a religious service organization whose membership was open to students, faculty, staff, alumni, and the general public. At the Commencement held on 20 June, the University awarded the degree of Doctor of Dental Surgery to Jessica Longsdorf Bozorth, Jane Nathan, and Esther Schupack. They were the first women to earn the D.D.S. degree at Penn. Dr. Bozorth and Dr. Schupack became practicing dentists in center city Philadelphia. Dr. Nathan became a practicing dentist in Johannesburg, South Africa. Also at the Commencement of 1917, the University awarded the degree of Doctor of Medicine degree to Clara Hillesheim. She was the first woman to earn the M.D. degree at Penn. Following graduation, Dr. Hillesheim returned to her native Minnesota, where she joined the staff of the Mayo Clinic in Rochester, Minnesota. The School of Dental Medicine appointed Carrie Kirk Bryant (B.S. in Biol., 1907) to the faculty position of Instructor in Bacteriology. In 1926 she was promoted to Assistant Professor of Microbiology and Bacteriology. For several years she served the School as chairperson of its Research Committee of the Faculty. In 1928 she co-authored, with J.L.T. Appleton, Jr., A Laboratory Guide in Bacteriology particularly for Students in Dentistry (Philadelphia: Lea & Febiger, 1928). She was the first woman to serve as an Officer of Instruction at the School of Dental Medicine and the first woman to be a member of that School’s standing faculty. The University established the position of Instructor in Physical Education for Women and the Department of Physical Education appointed Ethel Loring to that faculty position. She conducted women’s gym classes at the Kingsessing Recreation Center, 50th Street and Chester Avenue, in southwest Philadelphia. The editors of the Women’s Undergraduate Record for 1920 expressed enthusiasm about the athletic program, but noted the extraordinary difficulty in attending class so far from the center of campus. Ethel Loring was the first woman to serve as an Officer of Instruction in the Department of Physical Education. The School of Hygiene and Public Health appointed Edith Hedges Matzke, M.D. and Edith Hamilton Gordon, M.D. (Dr. P.H., 1921) to the faculty positions of Lecturer on Hygiene and Lecturer on Social Hygiene, respectively. Their work was funded by a “grant awarded by the United States Interdepartmental Social Hygiene Board” and they taught special courses of instruction in the School. They were the first women to serve as Officers of Instruction in the School of Hygiene and Public Health. In addition, both Dr. Matzke and Dr. Gordon accepted secondary appointments in the Department of Physical Education. The Department named Dr. Matzke to the faculty position of Medical Examiner for Women and Dr. Gordon to the faculty position of Instructor in Hygiene for Women. Dr. Matzke and Dr. Gordon also served as informal advisers to all undergraduate women. The Graduate School of Medicine was founded and matriculation was open to men and women alike.